Aqua-Tech Dam and Pond Sealer sealant systems from Aqua-Tech AGRI are specially formulated blends of super absorbent polymers designed to plug leaking dams and ponds. The product can be simply applied by hand to the surface water of a dam or pond and can start working within 45 minutes with no need to empty the dam or pond of existing water. long life performance - once polymers are in place they become part of the dam structure and will take many years to breakdown. 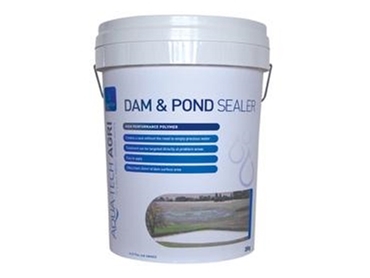 Aqua-Tech Dam and Pond Sealer is supplied in 20kg drums which will treat the dam walls and base under about 267 sqm of dam water surface area. Does this product work on a pool plastic liner that has creased and cracked on the floor of the pool used to collect garden water? 30/07/2013 - Unfortunately the product is not designed for this use. It has been designed for use in earthen dam and ponds situations.